These Winter Organization Tips Make Life More Productive All Year Long! The biggest problem with winter is that there are so many things that you just simply don’t use. Shorts and T-shirts are forgotten in a pile by your closet. When it comes to garage organization, gardening tools often go into a corner and take up space. In addition to storing summer gear, there is still plenty of winter we need to survive after the holidays. But what should you do with all the decorations that are now just taking up space around your home? There’s a reason why the term “spring cleaning” was coined. We let our homes get cluttered and disorganized so much during the winter that it’s necessary for us to set aside an entire weekend just to declutter and reorganize our living spaces. Well, now you can make things a little easier on yourself. If you can stay more organized this winter, you can avoid the mad chaos of spring cleaning and actually be able to enjoy those first few weeks of warm weather in a nice, comfortable living space. Sound like a dream come true? Follow these winter organization tips to organize winter clutter and sail smoothly into spring. Let’s be honest, we’ve all taken a look inside our closets during winter and thought, “When was the last time I wore that?” Those left over tank tops, swimsuits, shorts, and T-shirts from summer take up precious space that could be more wisely used for puffy coats and boots. And there is a way to make more room. The solution doesn’t involve your closet at all. The space under your bed is a vastly under-utilized space that can be used to store those seasonal clothes you aren’t using. Storing clothes in a thin, sliding bin gets the clothes out of your closet, it can’t be seen by anyone who comes into the room, and they are easily accessible when you want them again. 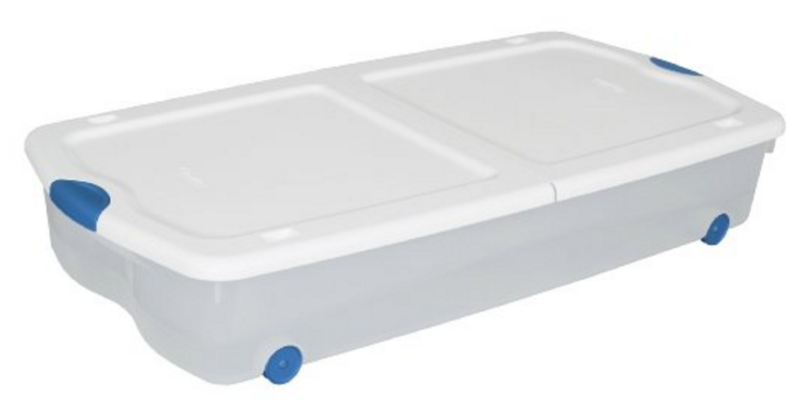 Just get a few long, thin storage bins, neatly pack away your clothes in them, and slide them right under the bed. No one will be the wiser. Garden rakes, hoes, and shovels are pretty much useless during the winter months. If you have anything that’s actually growing in your garden while snow is on the ground, you better call Ripley’s because no one will believe it. The best thing that you can do is get your garden tools out of the way so they don’t rust or take up too much space. The ideal way to do that is to get those tools up on wall hooks. 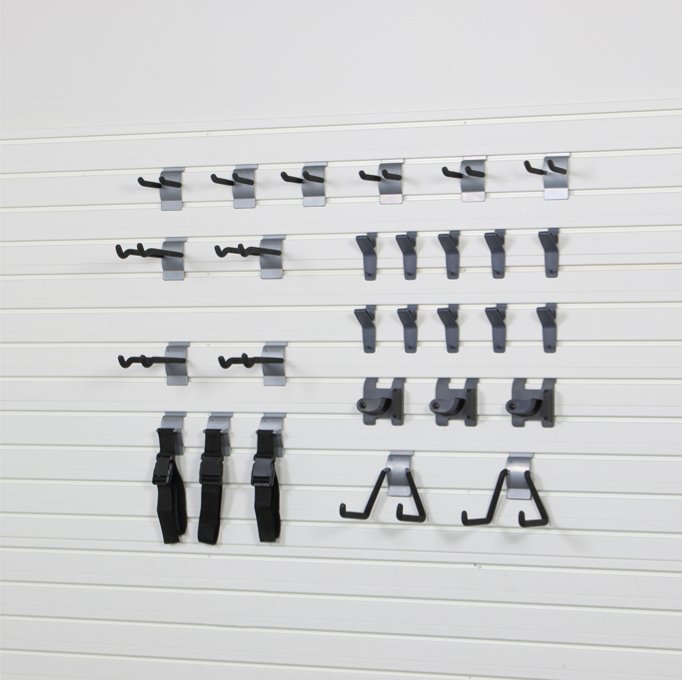 Flow Wall’s Deluxe Hook Bundle is ideal for this type of organization. No matter what type of tool you have, the Deluxe Hook Bundle can accommodate it. Sporting equipment can be some of the most awkward stuff to store during the winter months. More specifically: balls. Basketballs, volleyballs, dodgeballs, and soccer balls easily roll away and can be a pain to find when you need them after winter is over. It’s almost guaranteed they will never be in the same place that you originally put them when winter started. To solve this problem, you need an actual storage bin for your sporting equipment. 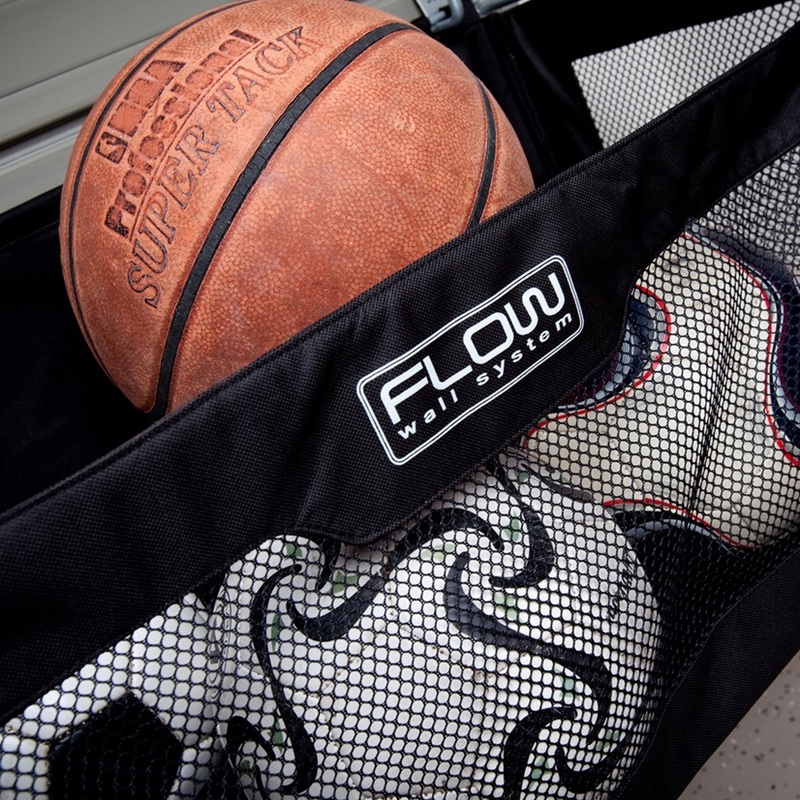 Flow Wall’s Soft Storage Bin is ideal for this type of storage. The Soft Storage Bin is so effective because it’s made with a strong and durable nylon mesh for easy and convenient storage, and the steel panel attachments and frame provide great strength. Additionally, when you leave sports balls on the floor, like many of us do, they tend to lose air really quickly. The Flow Wall Soft Storage Bin can be kept off the floor and attached to the wall, keeping it out of the way and easily accessible at the same time. The most important thing you need to keep in mind when you are storing things for the winter is to keep things clean and out of the way so you are comfortable all year long. After all, what’s the point of organizing any of your stuff if you aren’t comfortable? Spring cleaning doesn’t have to take up hours or even days of your time anymore. By simply utilizing the space that you already have in a more productive way, you may even be able to eliminate spring cleaning from your post winter schedule altogether!